We’ve been acting as thought scientists in my office at school. Studying the power of our thoughts and how they make us feel. Studying the power of the words that we tell ourselves and how they make us feel. I came across this experiment by Dr. Masuro Emoto, a Japanese scientist that studies the effect of words, thoughts and prayer on water, (http://www.masaru-emoto.net/english/e_ome_home.html). What he has found, although his experiments are controversial, is that water responds to thoughts and words upon freezing by forming more pristine beautiful crystals or by forming yucky-looking blob-like formations. He also reports that water is affected by words. When words of hatred and negativity are placed on water, it forms yucky-looking, asymetrical blobs when frozen. When words of love or positivity are placed on water, it forms beautiful symmetrical crystals when frozen. Given that we, as humans, are 80-90% water, it can be extrapolated that we are affected in similar ways. Regardless of the science, the basics are this: think positive=feel better, think negative=feel yucky. I wanted to see it for myself. Therefore my students and I followed an experiment created by Dr. Emoto and tried it out for ourselves these past few weeks. In early March we set up our experiment. The pictures posted here were taken today, April 24th, 2012. Here’s what we did. Following an experiment included on Dr. Emoto’s site or found on the site listed here, (http://www.positive-thinking-principles.com/positive-thinking-power.html), we cooked some rice. Next, we placed equal amounts of cooked rice (we used approximately 2 tablespoons) in each clean, glass jar and placed a lid, tightly sealing the container. To the outside of the jar we added sticky notes that read “you fool” and “thank you” and placed one sticky note on each jar. We placed the jars side by side on the counter in my office. Each day for a week, we took turns directing negative thoughts and comments towards the “you fool” jar and directing positive, loving thoughts towards the “thank you” jar. Nothing happened, i.e. we noticed no visible change in the rice, for the first week. We went on spring break and the rice jars sat in my office without any attention for the next 10 days. Upon return, we noticed that the “you fool” jar had a green, gray mold growing on top of the rice and the “thank you” jar had only a yellow/orange mold growing on it. 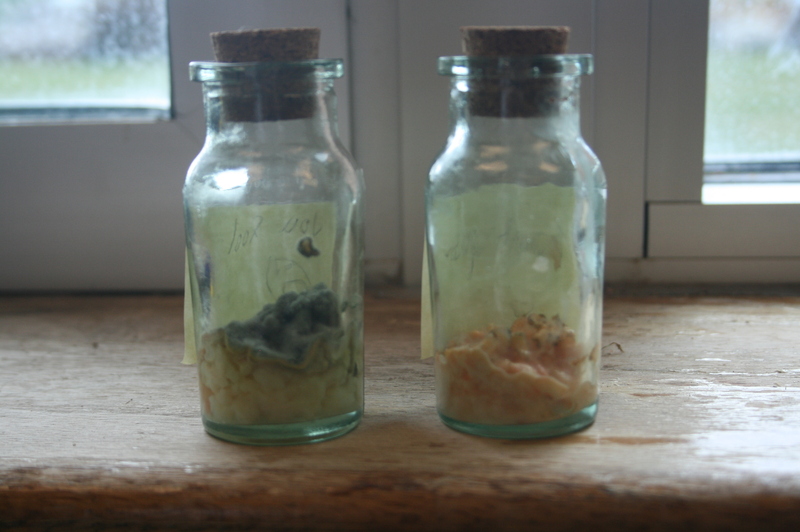 Over the next few weeks, the “you fool” jar’s green mold grew very fast. The “thank you” jar continued to look the same, with a light yellow/orange color growing on top. The rice in the “thank you” jar continued to look like rice. The rice in the “you fool” jar began to clump together under the foamy green/gray mold. It was obvious that the “you fool” jar’s mold was growing and fermenting faster. We studied the progression in awe. It was amazing to see that the simple power of words appeared to be impacting the rice inside, regardless of our attention or not. I even moved the jars to a closet for a week and gave them no attention, thinking that maybe the “thank you” jar would begin to follow the “you fool” jar’s fermentation pattern. No effect was observed. The “thank you” jar appeared to be almost “protected” so to speak from rapid fermentation simply by virtue of the fact that “thank you”, a word of gratitude and love, was attached to it. I took the results to a staff meeting, using the visual to remind all of us that our words carry power. We have the ability to choose to show up with love or negativity and notice how it feels inside based on our choice. As the students and I marvel at our results, we have begun to pay extra attention to our thoughts and the words we share with others. Every day, they rush into my office to see if anything has changed in the jars. I will have to throw it away someday soon. What a wonderful activity to try out within your own sphere of influence. See what happens and let us know! Regardless of the results, it is a powerful way to increase awareness of and to begin to really pay attention to the thoughts we think and the words we use when talking to ourselves and others and to notice the power thoughts and words carry into the internal world within ourselves and the external world we share with others.